The Fed has delayed further rate increases due to slow growth worldwide and continuing low inflation in the U.S.
Perhaps as important, no rate increase is another signal for further declines in the value of the U.S. Dollar, which helps U.S. manufacturing, emerging market growth, and opens the door for more monetary easing in China, India, and Europe. Japan is a different story. 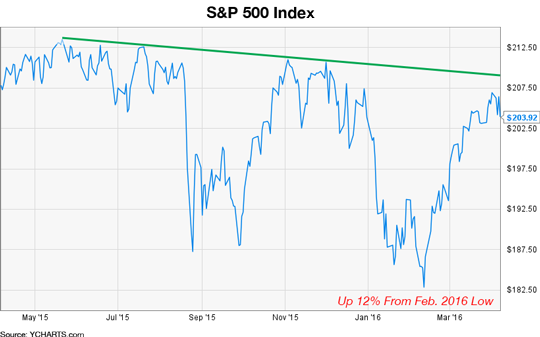 Two lesser known leading indicators are pointing upward. One is the ECRI (Economic Cycle Research Institute) Weekly Leading Index, and the other is a broad based measure of monetary aggregate growth called the Divisa M4 monetary aggregate index. The consumer savings rate is quite good, in fact, consumer debt is also low—unless you just graduated from Med School--and housing values have held up nicely. The U.S. total national wealth of the country is at an all-time high. U.S. Government debt is higher than we might like, but it is affordable as long as the economy keeps growing. Earnings expectations are fairly low for the first quarter of 2016. Even though stock market multiples are fairly high, high multiples don't usually kill a bull market. I also feel that the political rhetoric around this year's Presidential Election has been unusually controversial and this is negative for economic growth and confidence. The country is quite divided, but I strongly believe that once the direction is clearer, cooler heads will prevail. This direction should lead to better economic growth, which could be preceded by sizable stock market movements. Usually years 3 and 4 of the so-called "Presidential Stock Market Election Cycle" are the strongest. Year 3 was 2015, which was volatile, but it went nowhere. 2016 could be the big surprise. Oil prices should benefit some from the lower U.S. Dollar, solid demand, improving refining margins, and declining U.S. production, especially as 2016 progresses. However, I feel that Iran's true oil production goal is 6 million barrels per day, not the 4 million often mentioned, which should help keep a ceiling on oil prices. Oil prices seem to be more of a coincident economic indicator, as opposed to a leading indicator. If the above scenario proves true, stock market gains could be sizable, but certainly better in some groups than others. One group that is seriously undervalued is the MLP group. IF the next move is up, I am convinced that the MLP group of stocks will once again have led the market and will outperform others. 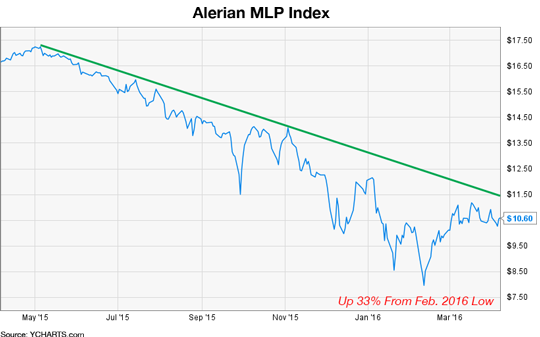 This is illustrated by the S&P 500 and Alerian MLP Index charts below; take note of the corresponding downward trend lines. If these lines can be broken to the upside, markets could get very interesting. Granted, some pure commodity play MLPs will have serious financial issues, but midstream pipeline and refinery MLPs and downstream oriented "wholesale-retail" related MLPs should have an excellent future once they have adjusted to the ways lower oil prices impact their earnings and balance sheets. Depending on tax issues, one could argue for some consolidation of certain MLP companies themselves! Expect the unexpected.